Following liquid diet weight loss plans is a popular way to lose weight because the diets are convenient and can produce results in terms of weight loss. 1. Performing strenuous exercise – It is advised to stay active and workout moderately if you are fasting to lose weight. But experts advice not to do strenuous exercise such as heavy weight training. 2. Neglecting to drink enough water – Although you will be taking good amount of fluids, you should still drink plenty of water. 3. Neglecting to take a multi-vitamin – Many liquid detox diets advocate the consumption of only certain ingredients such as lemons and lemon juice. This can lead to nutrition deficiencies. 4. Severely restricting calories – Experts advice people with fair amount of lean muscle mass against restricting calories on a liquid diet or following HCG diet phases of the 500 calories/day HCG diet. 5. Not consulting a doctor – Medically supervised liquid diet weight loss plans have appropriate amounts of protein, carbohydrates, vitamins and minerals. Without proper supervision, you could lose muscle and experience dehydration along with other side effects. 6. Buying meal replacement products – Experts advice to get your nutrients from organic whole foods and not boxed meals. 7. Not taking enough electrolytes – On severe liquid weight loss diets, it is easy to ignore taking essential electrolytes. 8. 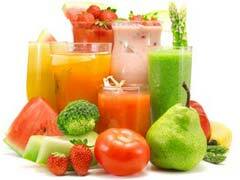 Fasting for too long – Liquid diets are best followed for a couple of days. Prolonged fasting on severe diets such as grapefruit diet, can lead to severe malnutrition and various health problems. 9. Eating sugary food – Melted popsicles and ice cream shakes are allowed on full liquid diet. But on a liquid diet weight loss plan, they should be avoided. You should receive your calories from organic fruits and vegetables. 10. Ignoring protein – Include complete protein into your diet through organic protein powders to sustain your lean muscle mass.